Minced beef with red kidney beans and textured wheat protein in a mildly spiced tomato sauce. Stockwell & Co. provides all the traditional pantry essentials you need to put good, honest food on the table – at a price that's always right. Minced beef with red kidney beans and textured wheat protein in a mildly spiced tomato sauce. 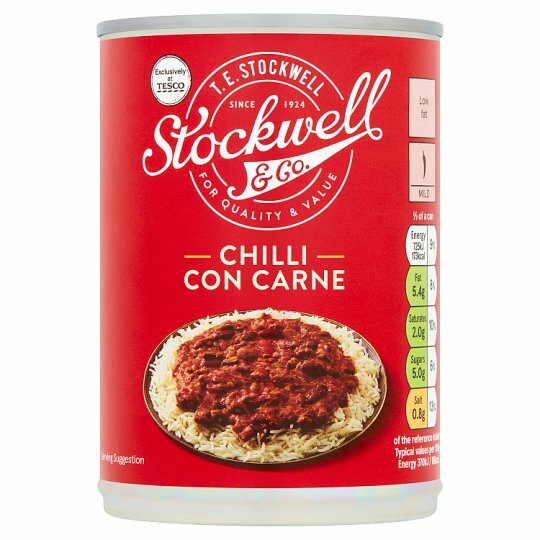 INGREDIENTS: Tomato Purée, Red Kidney Beans (22%), Beef (16%), Rehydrated Dried Onion, Red Pepper, Green Pepper, Textured Wheat Protein (1%) [Wheat Gluten, Malted Barley Extract], Cumin Powder, Modified Maize Starch, Salt, Sugar, Cayenne Pepper, Garlic Powder, Oregano, Colour (Paprika Extract). MICROWAVE Empty contents into a non-metallic bowl and cover. Microwave for 800W 2 mins / 900W 1 mins 20 secs. Stir, then microwave for 800W/900W 1 minute. Leave to stand for 1 minute after heating. Stir well before serving.